The audio player below and to your right should start automatically from any desktop or laptop browser (Google Chrome suggested.) Those with mobile devices may need to press the 'Play button' to start the audio. Pressing 'pause' delays the feed. Pressing 'Play' again, continues where you left off. If you want the live feed, you will need to reload the page.Android phones (devices) should try to use a 'Chrome Browser app' if available for best results. The feed is delivered in an MP3 format. If you are unable to receive the feed, try whatever different browser app is available to you from your specific 'App store'. On January 1, 2000, the Region of Waterloo created GRT by assuming the operations of the former Kitchener Transit and Cambridge Transit. 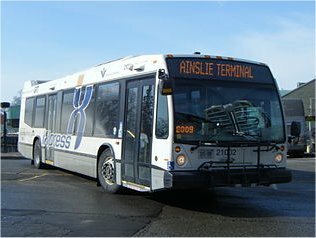 By the end of that year, operations had been fully synchronized, and buses began running between Cambridge and Kitchener. As a result, ridership in Cambridge improved dramatically. In recent years, many new low-floor wheelchair-accessible buses have been purchased, and now constitute the majority of the fleet. GRT installed bicycle racks on the front of its buses in order to encourage the use of sustainable transport; all standard and express buses now have these racks. Service to less dense areas is provided by the busPLUS system, large vans which take regular fares on scheduled routes to new neighborhoods and more remote facilities. GRT also operates MobilityPLUS, which provides specialized transit for disabled patrons using minibuses equipped with wheelchair lifts. The audio player to your right allows you to listen to the new Region of Waterloo Light Rail Transit (LRT) communications. At the moment the system is being tested and prepared for operational duty, so audio may be limited. 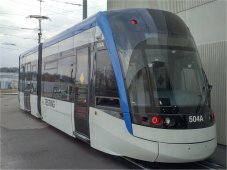 The LRT is not functional at the moment, so all communications heard will undoubtedly be maintenance related as personnel check and prepare the entire system. The start date for the system is expected to be late 2019. To listen to all communications you must press the play button on the audio player to your right. The following information was taken from GRT website, and is valid as of March 2013. The GRT have roughly 66 regular routes that service the Waterloo region. All routes in Cambridge are 'accessible'. Over 85% of buses that service The Region are 'accessible'. Some of the busiest routes are route 7, iXpress, route 8 and route 12. These routes connect the cities of Kitchener, Waterloo and Cambridge making it easy for intercity travelers. The GRT has 238 'low floor' diesel buses. All 'high floor' buses have been retired. Of the 238 buses in the fleet, 16 buses are Hybrid Electric buses and 196 are equipped with accessibility features. GRT operates 29 MobilityPLUS vehicles for disabled patrons. Grand River transit has over 500 employees and services 2791 bus stops. In addition to the GRT bus service communications scanner there is a second scanner set to capture communications related to the LRT. The Region of Waterloo employs an EDACS trunked radio system for their Police, Fire, Transportation and other city services. What is EDACS? EDACS is a radio communications system that provides high-speed wireless analog voice, digital voice, and data communications. The system is comprised of primary control channels and alternate control channels. At any given time, each site (Police, Fire, City Services etc.) has one control channel. The remaining channels are used as working channels, and functions such as call queuing, emergency calls, and call prioritization are always available. The Transit and LRT scanners are programmed to receive certain talkgroups from within the Waterloo Region EDACS system, and are listed below. Primary control frequencies ( also listed below) are in red.